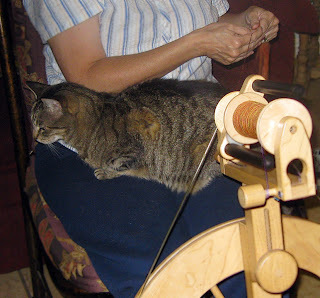 AJ kitty is getting a little put out with all the Tour de Fleece spinning. Our usual evening routine involves my sitting in a recliner, legs outstretched, with Her Highness sprawled asleep on my legs. But for the past week and a half, I've spent my evenings spinning while watching the Tour de France. I guess she finally figured if you can't beat 'em, join 'em. AJ whined at my feet until I picked her up and put her in my lap. She tried biting that interloper yarn, but when threatened with banishment, she settled down and sat on my lap for over 30 minutes, while my legs moved up and down with the treadles. I'm not sure she was very comfortable but she was determined. 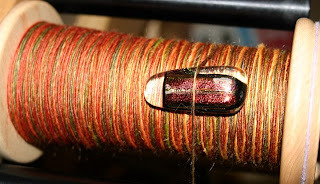 Good news - the Twisted merino/mohair is all spun up; I just need to ply it tomorrow and it is done. Haven't decided what I'm going to spin next. Maybe my prize yarn from All Spun Up; or the new stuff from Rocket Yarn; or something from my current favorite vendor, BeeMiceElf. 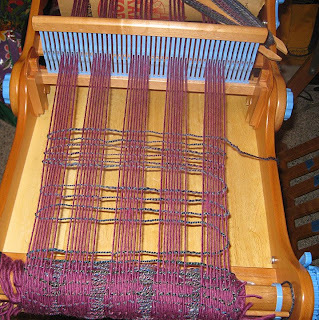 I was also able to put another warp on the knitter's loom and get it about 3/4 woven. This is the same warp/weft as the first felted woven scarf. I'm experimenting with a much looser weft placement to see if I can get a more lacy effect. Should have this finished and felted tomorrow.